Reign of the Supermen finds Earth’s citizens – and the Man of Steel’s heroic contemporaries – dealing with a world without Superman. But the aftermath of Superman’s death, and the subsequent disappearance of his body, leads to a new mystery – is Superman still alive? The question is further complicated when four new super-powered individuals – Steel, Cyborg Superman, Superboy and the Eradicator – emerge to proclaim themselves as the ultimate hero. In the end, only one will be able to proclaim himself the world’s true Superman. 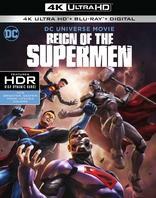 Reign of the Supermen is the second half of a two-part DC Universe Movies experience that began in August 2018 with The Death of Superman – the two films telling a more faithful animated version of “The Death of Superman,” DC’s landmark 1992-93 comic phenomenon. Superman Doomsday, the inaugural film in the DC Universe Movies series, told an abridged version of that comics story, but with a runtime of 75 minutes, the film was only able to focus on a core, singular storyline. The Death of Superman and Reign of the Supermen restore many of the moments and characters that fans hold dear to their hearts. Special Features:Featurette: Lex Luthor – The Greatest NemesisA Sneak Peek at the next DC Universe Movie, Justice League vs. The Fatal FiveFrom the DC Vault: Superman: The Animated Series, "Heavy Metal"From the DC Vault: Justice League Unlimited, "Panic in the Sky"